The 'Fire Ready' message from the CFA is for households across Victoria to assess their homes to determine the fire risk, as well as establishing a written Fire Plan in the event that their home is threatened by fire. 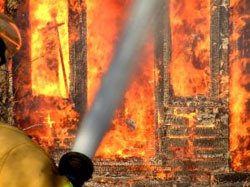 The previous 'Stay or Go' policy has essentially been scrapped after the Black Saturday fires in February 2009 when many families unsuccessfully tried to defend their homes in the firestorm. For outer suburban areas the CFA has identified 52 communities within Victoria at high risk which require Township Protection Plans. The Protection Plans involve educating residents about local emergency contacts, road networks and establishing Neighbourhood Safer Places. Neighbourhood Safer Places are places of last resort for residents to consider, as a place of santuary should they be at direct risk from a bushfire, and their personal Fire Plan has failed. The CFA is facing challenges finding suitable locations (like football ovals, or existing areas sufficiently removed from fire hazards and vegetation) in many townships. There are also the risks that people face in moving to a Neighbourhood Safer Place during a fire should their own home no longer be safe. The Neighbourhood Safer Place is not a guarantee of people's safety and emergency services may not be present to protect those using the facility. The issues faced concerning the Neighbourhood Safer Places show why having a Fire Plan is so important so that the risk of getting caught in a firestorm is minimised.